Not seen anyone cheaper, can you recommend anyone? Try D&B . There is little about all round at present. Due to uncertainty over BREXIT. People who have Deacts refuse to pay out extra & get them welded up solid to EU specs. And I think People most want to keep them in thier collection anyway. Not much is going to Happen until we extract from the Corrupt & Dictatorial EU is the bottom line at present! Another option is a metal replica. I'm sure that there are forum members who can recommend one or more makers. When we Brexit, I’ll be selling some of my collection. I’ll probably keep one of each Bren and Sten variant and sell the duplicates off. I’ve far to many anyway. keep an eye on gunstar.co.uk. I have used a chap called Kev on there for a Bren and he was very good. If you struggle to find a deactivated sten then a Model Gun replica might work for you. MG-Props.co.uk have a good selection and they field strip unlike some deacts. Thanks for that, got sorted with a deactivated bren and sten, been talking to crosefire today about a 30 and 50 cal replica as there dont seem to be any deactivated ones about, picked up a M1 carbine at newark militaria show on sunday for the jeep. Next on the list is GPMG for the sabre ! Try Stoneleigh on the 3rd February. There will be 30 cal, 50 cal and GPMG available. 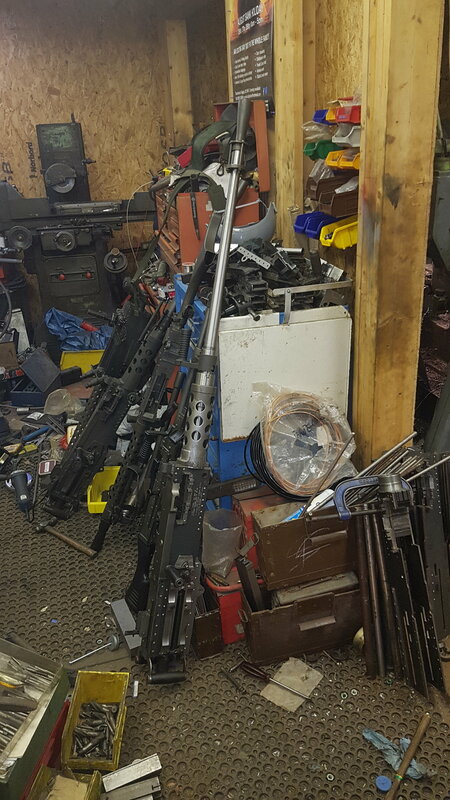 I have a surplus co-ax GPMG that will be perfect for Sabre or Fox that will be there. Have you got a radio set-up for your Sabre? I have a complete installation that would suit Fox or Sabre. It has correct radio tray with 4 rail mounts and 4 x anti-vibration rubbers, 2 x Clansman VRC 353s in working order, 2 x TUAMs + ARFATs and a pair of very rare genuine Racal TUAM+ARFAT handed mounting brackets for Fox turret, lots of connecting cables, 2 x NOS Racal aerial mounts, 3 section aerials, commander's chest piece and NOS 12 way flex , some hull boxes and good headsets with pressels. If you are interested I can bring them to Stoneleigh. Has your Sabre got the 2 rear 7.62 ammunition bins that fit either side of the radio installation? I have a spare pair of good second-hand ones I no longer need. Here is a photo of a QCB M2 HB 50cal and tripod I made last week. It has full cocking breech and cartridge feeding mechanism for stripping and demonstration purposes. (Tripod is replica of UK special forces aluminium lightweight). Also a photo of my workshop last week where you can see that 50cal on trial assembly before stripping and phosphating. If you look carefully you can also make out an L7A2 GPMG, an A6 1919 Browning and several A4 Brownings. Oh...I also just found a box of fire extinguisher brackets (the narrow type). Second-hand take offs but many in good condition. Any use? Are you at stoneleigh on a trade stand? Yes. Chris Goulding and I have a stand at Stoneleigh. 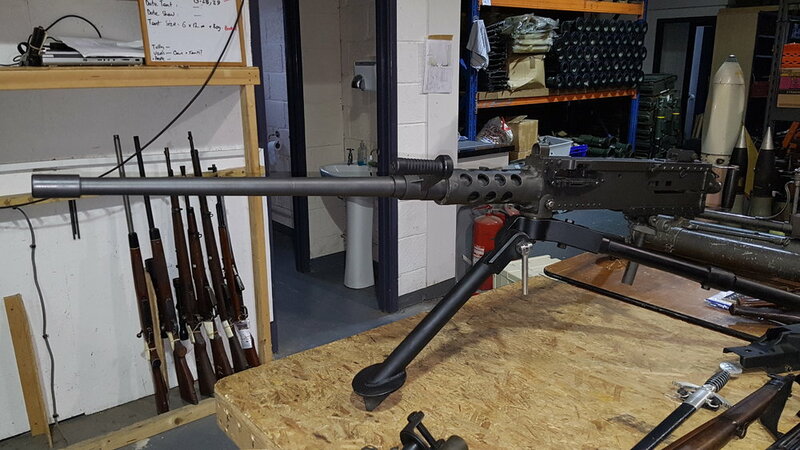 We are a couple of retired engineers who share a common interest in military vehicle restoration, especially the manufacture and development of realistic looking and feeling legal GPMG. 30cal and 50cal replicas. We have stand 123, which is a corner plot, straight ahead from the main entrance.